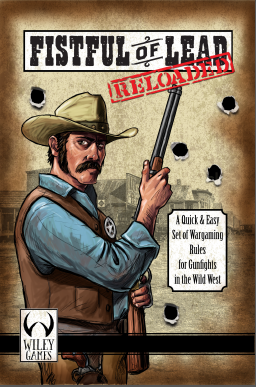 Fistful of Lead: Reloaded was designed as a quick set of wargame rules for gunfghts in the Wild West. I like rules that can be learned within a couple of turns and still keep the favor of the period. I wanted the play to be fast and furious, with a Hollywood fair to it. In most games, each player can control up to 6 gunfighters without much trouble. Games can have up to 8 players without slowing down the game. Experienced wargamers and new players alike will enjoy this game. It's perfect for convention games and just one on one shoot outs. Paul Morrissette 10 10 10 A great simple set of rules. THe expanded Campaign rules allow you alot of freedom to give colour to you games. Carl Parlagreco 8 8 8 This game is a lot of fun. Very uncomplicated, but it plays well, and gives a good feel for an old west gunfight. My first game was with someone elses rulebook, and I enjoyed it so much that I went and bought my own copy. Cheung Kar Fai 10 9 9 Easy to learn, great fun, recommended. Christian Nielsen 9 9 9 Simple in a good way, and lots of fun. Suited for both wargaming beginners and crusty grognards. Michael Schroeder 10 9 10 A great update to a great game.